Kids Woodland Camo Reversible Fleece Lined Nylon Jacket w Hood is made as per military and army style. 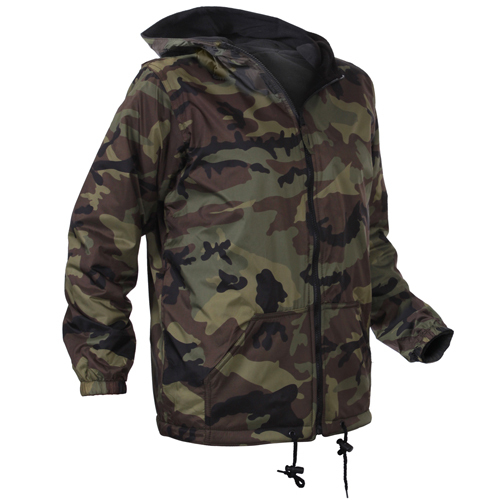 The kids jacket is made with nylon outer shell which makes it water proof. The woodland camo design on the outer shell makes it more attractive. The hood has drawstring with plastic adjustable pulls. The drawstring hem is an additional feature. It has polyester fleece lining. It can be worn on both sides as the jacket has reversible black lining on the other side. It has two slash pockets on the front and on inside. The pockets are not provided with snap closures. The elastic wrist cuffs make it more comfortable to wear.